Traditionally, central nervous system masses have been debulked manually which can lead to iatrogenic trauma, prolonged anesthesia, a larger residual mass burden, and many other unwanted effects. Ultrasonic aspiration helps to solve for these issues and has been used for years in state-of-the-art human neurosurgery. The Columbus Neurosurgery Department now routinely uses a cavitron ultrasonic surgical aspirator (CUSA). The CUSA simultaneously fragments pathologic tissue while providing suction and irrigation. It distinguishes pathologic tissue from normal tissue, thus preventing damage to healthy parenchyma. Ultimately these features result in minimal brain and spinal cord disruption, reduced surgical time and improved patient outcomes. “Neurosurgery can seem very frightening, particularly when it comes to our own pets. The neurosurgical advancements made in veterinary medicine in the last 10 years are astonishing. With today’s techniques and equipment, we are literally watching veterinary neurosurgery transform before our very eyes. Patients are living longer, happier, healthier lives all while exceeding expectations”, Dr. Mathew Lovett, MS, DACVIM (Neurology). 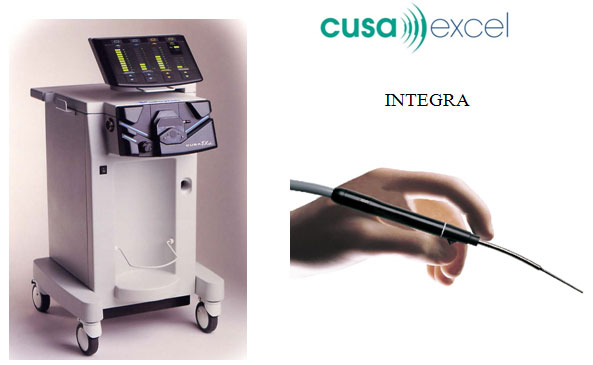 While the CUSA has redefined neurosurgery, it is also proven to be beneficial for many general surgery applications. These include: partial pancreatectomy, liver lobectomy, pyloric surgery, cholecystectomy, various benign/malignant masses where wide margins are difficult to obtain, adrenalectomy and nephrectomy/partial nephrectomy. Dr. Robert Dudley, MS, DACVS continues to pioneer the use of the CUSA for general surgery applications at MedVet. Ultrasonic tissue ablation utilizes state-of-art technology to provide a safe, effective, and reliable treatment for many different neurosurgical and general surgery procedures.